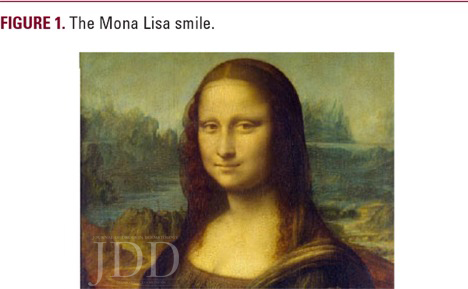 When viewing the most famous smiles in history (Figure 1), two constants become apparent: a smooth perioral surface and oral commissures that are turned upward (or horizontal as a minimum). Patients are often fixated on improving both the marionette lines and the downward oral commissures as these distractions are one of the most noticeable areas in the aging face to the average person. In addition, the downward turn of the oral commissures gives an impression of sadness. Unfortunately, the anatomy of this area makes non-surgical treatments less than satisfactory, and unpredictable in many cases. Frank Rosengaus-Leizgold MD, has developed a novel technique to treat the marionette lines and turn the corner of the mouth upward that has been named the Happy Face treatment. The key for a successful outcome is the assessment of the perioral anatomy and the understanding of the physio dynamics of the jowl to produce a Mona Lisa smile and a Happy Face. The lower third of the face reflects many of the most prominent changes of aging. 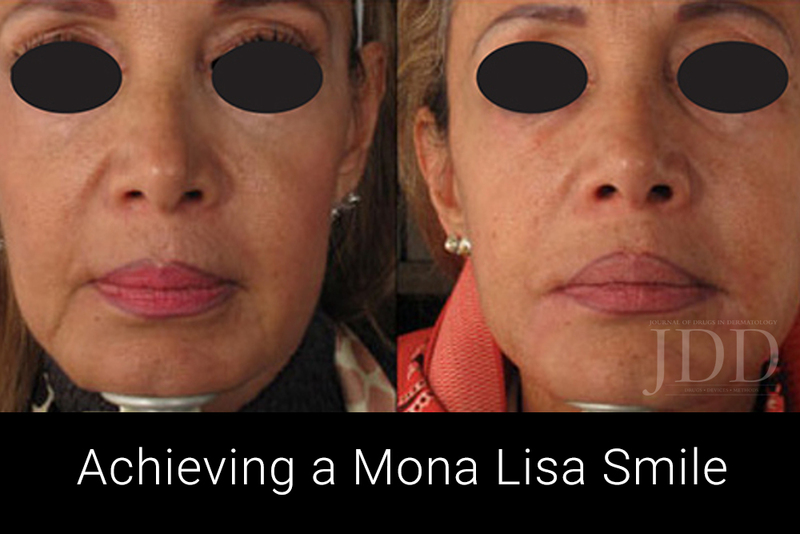 The loss of structural support is reflected by the corner of the mouth, which falls downward creating a depressed triangle, accentuating the appearance of the jowl and the labiomandibular fold, also known as the marionette line. All these changes in the perioral area can give an impression of sadness and aging that is unpleasant for the patient.1 In many cases their correction is insufficient or inadequate due to the presence of creases, lines, wrinkles, skin irregularities, and muscle hyperactivity. The Happy Face technique provides a better solution for these problems. 1) Turn the corner of the mouth upward or as minimum horizontal oral commissures. 2) Homogenize the amount of volume of both sides of the labiomandibular fold in order to achieve uniformity and evenness. Conventionally, in the upper half of the face, the main problem is wrinkles secondary to muscle hyperactivity, which can be treated with botulinum toxin type A.2 In the lower half of the face, there are lines and folds secondary to skin laxity and loss of volume. The proper treatment is to restore this volume with dermal fillers. However, how should one address the dynamic component of lines and wrinkles in the lower third of the face due to muscle hyperactivity without the frequent unpleasant paresis associated with neuromodulator use? There are more muscles involved in the regulation of movement of the aperture of the mouth than muscles in the upper and midface combined. There are ten muscles around the perioral area and at least seven of them have the same fixation point called the modiolus, located about 1cm lateral to the oral commissure.3 The depressor anguli oris (DAO) is one muscle particularly responsible for the downward pulling of the oral commissure. The DAO and the depressor labii inferioris (DLI) have been demonstrated to have strong miodermal attachments for mimicry and facial expression. The continuous movement is the cause of many of the lines, creases, and irregularities found in the inferior perioral skin. Taking these points into consideration, we propose a subcision technique using a cannula that separates the skin from the labiomandibular ligament and part of the DAO and DLI muscles. The subcised area smooths out the skin, while simultaneously allows one to design a subdermal space that can be safety filled to achieve evenness and regularity in the perioral area. 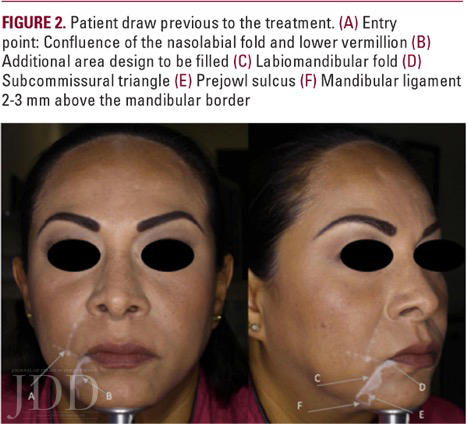 Another benefit is that the subcision and separation of the labiomandibular fold from the oral commissure allows the oral commissure from being pulled downward and to achieve a more upward position. Finally, if needed, the prejowl sulcus can also be directly treated at the end of the procedure. 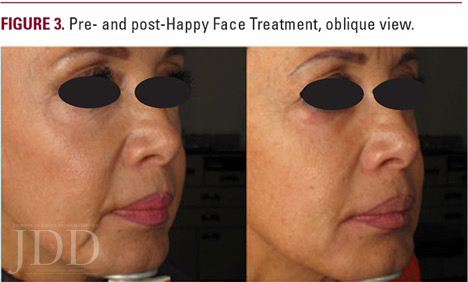 If the lower third of the face is recognized as an area requiring treatment for beautification purposes after a personalized facial assessment, a Happy Face treatment is suggested. The main conceptual basis of the Happy Face procedure is the separation of the skin from the depressor muscles to also create a plane to be filled with hyaluronic acid (HA) of medium to high G’ with good product tissue integration7 using the cannula as a subcision tool. The initial step in the Happy Face procedure is marking the patient. For this purpose, the jowl is pushed forward and the marionette line is marked. A subcommissural triangle is also drawn and further labiomental areas that have irregularities that need to be subcised are also marked (Figure 2). Inferiorly the mandibular ligament is drawn 2 mm above the mandibular border and the area of the prejowl sulcus is outlined. The entry point for the cannula is marked by the crossing of a line extending laterally from the lower vermillion and the nasolabial fold on each side. This location is very useful because there are no important underlying vascular structures rendering this entry point relatively safe. There is a good superficial fat compartment facilitating sliding the cannula subdermally. In addition, one can direct the cannula superiorly and treat the nasolabial fold if desired from the same insertion point. The authors prefer a 25 G cannula (Softfill precision cannula), introduced and slid subdermally towards the oral commissure until touching the labiomandibular ligament. Taking the tissue between two fingers, the cannula is softly pushed through the ligament back and forth until a subcision of the labiomandibular ligament starting from the oral commissure for a length of 5-10mm inferiorly is completed. Subcision of the pre-marked areas medial to the labiomandibular fold are then done. The pre-jowl sulcus is not subsized. Once the area is fully liberated and the cannula can be easily displaced side to side, the HA is injected until complete smoothing of the area is attained. Soft massage can be done as well. Watch accompanying video by clicking below. 1) The subcision of the dermal attachments to the labiomandibular ligament allows normal muscular mobility without the formation of deeper commissures, grooves or wrinkles. 2) The subcision “creates” the space necessary for the insertion of the HA filler. Side effects of the technique are minor. The patient may have discomfort around the oral commissure for 2-3 days and bruising secondary to the cannula subscision. 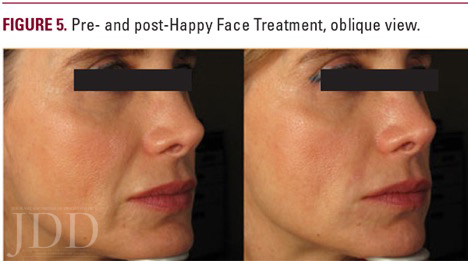 The Happy Face technique is an individualized treatment that subsizes the area to be filled in order to achieve smoothness all around the perioral area, eliminate the marionette lines, and provide better lift of the corner of the mouth. This technique is novel and safe because it is done with a cannula. There are no vascular or nerve structures that can be harmed with a cannula in the subsized area. 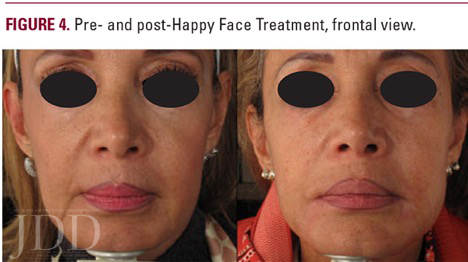 The Happy Face treatment is a good option to return youthfulness to the lower third of the face. Once the technique is understood, it is easy to perform with minimum pain. The results will be superior to simple injection techniques that do not involve any subscision. The cornerstone of a good result in dynamic motion is the thorough knowledge of the facial anatomy. This includes the perioral muscles, to obtain a youthful Mona Lisa smile without compromising function nor aesthetics in the perioral area. A Happy Face is a happy patient. 1. Brandt F, Cazzaniga A. Hyaluronic acid gel fillers in the management of facial aging. Clin Interven Aging. 2008;3(1) 153–159. 2. Ascher B, Talarico S, Cassuto D, Escobar S, Hexsel D, Jae´n P, Monheit GD, Rzany B, Viel M. International consensus recommendations on the aesthetic usage of botulinum toxin type A (Speywood Unit) – part I: upper facial wrinkles. J Eur Acad Dermatol Venereol. 2010;24(11):1285-95. 3. Hutto JR, Vattoth S. A practical review of the muscles of facial mimicry with special emphasis on the superficial musculoaponeurotic system. AJR. 2015; 204:W19–W26. 4. Pessa JE, Garza PA, Love VM, Zadoo VP, Garza JR. The anatomy of the labiomandibular fold. Plast Reconstr Surg.1998;101(2):482-6. 5. Mendelson BC, Freeman ME, Wu W, Huggins RJ. Surgical anatomy of the lower face: the premasseter space, the jowl, and the labiomandibular fold. Aesth Plast Surg. 2008;32:185–195. 6. Rohrich RJ, Pessa JE. The fat compartments of the face: anatomy and clinical implications for cosmetic surgery. Plast Reconstr Surg. 2007;119(7):2219- 27; discussion 2228-31. 7. Kablik J, Monheit Gd, Yu L, Chang G, Gershkovich J. Comparative physical properties of hyaluronicacid dermal fillers. Dermatol Surg. 2009;35 Suppl 1:302-12. Source: Rosengaus-Leizgold, Frank, Elizabeth Jasso-Ramírez, and N. C. Sicilia. “The Happy Face Treatment: An Anatomical-Based Technique for the Correction of Marionette Lines and the Oral Commissures.” Journal of Drugs in Dermatology: JDD 17.11 (2018): 1226-1228. Used with permission from the Journal of Drugs in Dermatology. Previous PostPrevious I Finished Residency! Now What?